Happy Cinco de Mayo, everyone! I honestly have no idea what this traditional Mexican holiday is celebrating. All I know is that us Americans love to eat Mexican food and drink tequila on the 5th day of the 5th month every year. Maybe the Mexicans do the same thing? Anyways, this is the latest (of many) Mexican dishes I’ve made. I truly have loved pretty much every single one of them. If you want to browse my various Mexican-themed recipes to try for your Cinco de Mayo party, click here. One thing I love about this Burrito Bake is that it is Weight Watcher friendly. Yes, even with all that gooey cheese on top, this is only 6 points per serving. So go ahead and celebrate Cinco de Mayo with your friends and don’t feel guilty about it! No one will ever never know it’s healthy because it tastes so good! It’s also crazy simple to make. 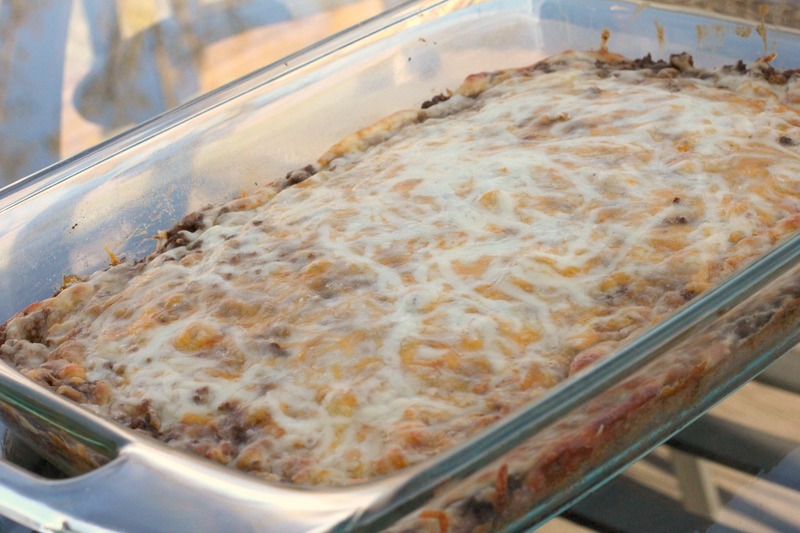 Brown beef, add taco seasoning, add to layer of beans, top with cheese, bake. BOOM, you’re done! Brown ground beef and drain, add taco seasoning and 2/3 c water and let simmer for about 3 minutes. Mix Bisquick, water and refried beans in a small bowl. Place bean mixture into a greased 9x13 pan. Sprinkle taco meat on top, then add both cheeses. Here is a great and very easy recipe from Lindsay who does a great cooking site entitled “Normal Cooking”. 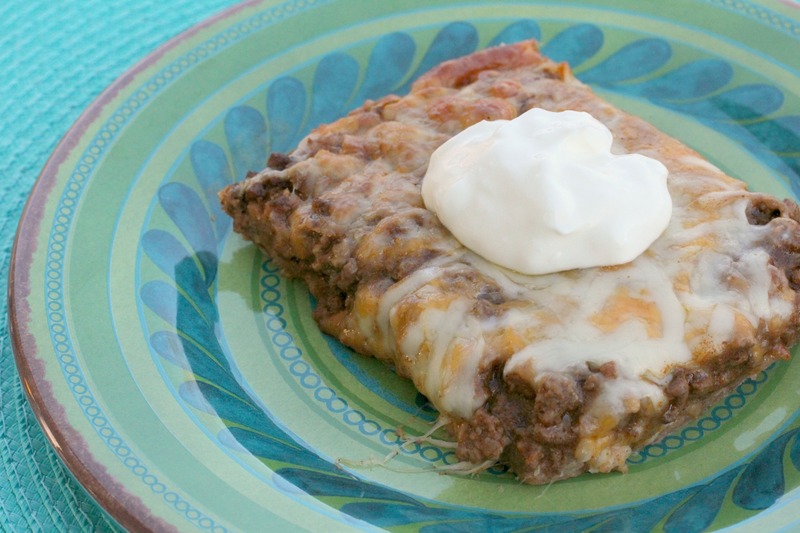 She puts together this Cinco de Mayo Burrito Bake that uses ingredients you will find in your pantry like re-fried beans, Bisquick baking mix and some other ingredients that will fit your busy schedule. This looks so tasty! I love making Mexican casseroles. Thanks Shae! I do too, they’re so easy! I can do this using gluten free Bisquick! Thank you!! Great idea! Thanks for the info! Cinco De Mayo is the celebration of the Mexican Army’s victory over France in 1862 at the battle of Puebla during the Franco/Mexican war I think the US celebrates more than Mexico We’ll use any reason for a celebration, especially if it involves fun and food. This casserole looks yummy and super easy Can’t wait to try it. Thanks for the info Debbie! And you’re right, it’s not surprising that us party animal Americans celebrate more than the Mexicans do! Just a note: Many of the ‘Americans’ you speak of – as opposed to ‘Mexicans’, are of Mexican origin, either having immigrated themselves, or through ancesters who immigrated to the United States. They are no less ‘American’ than you or I.
I wasn’t referring to Mexican-Americans I actually meant Mexicans who live in Mexico and how they celebrate (or don’t celebrate?) Cinco de Mayo. Delicious and super easy to make! It definitely fills you up for just 6 points. Thanks for sharing! Thanks McKinsey! It’s one of my favorites! Do you know how many carbs is in this ? Sorry I don’t have exact ounces or anything for the serving, but a serving is 1/8th of the 9×13.